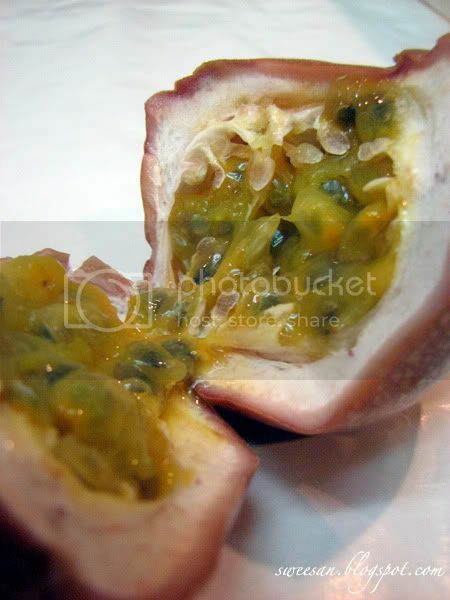 I have this secret obsession towards passionfruit. The sourness of it is so refreshing and the seeds gives it a whole new texture. I love eating them with yogurt and pavlova. Maybe ice cream too lol.. Best part of all, it last for quite a while if you keep them in the fridge. 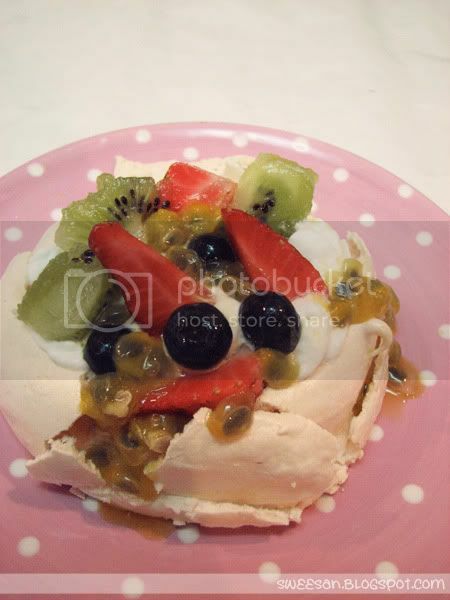 Since passionfruit are often sourish, I decided to make some pavlova to go with it. Pavlovas = sweet max. Pavlovas are often just baked meringue and topped with summer fruits and cream. 1. Preheat oven to 180 C. Lay baking sheet with parchment paper. You can draw circles if you want to get a consistent size, otherwise just eye ball it. 2. In a mixing bowl, whisk egg whites and cream of tartar till foamy and not transparent. Increase speed and continue whisking till soft peaks form. 3. Gradually add in caster sugar and whisk till meringue is glossy and shiny. Add in vanilla and continue whisking. The meringue should be somewhat stiff peak. 5. Put the tray in the oven, turn down the heat to 150 C and bake for about 35 minutes. Turn off oven and leave them inside the oven for another 20 minutes or so to dry them out. Once they’re baked, remove them from the oven and cool. 6. To assemble, whip cream and pile on fruits. Assemble them just prior to serving. If you’re not serving them, they can be kept in a container for a week. Wow, wow!! I've been wanting to make pavlova!! Maybe after CNY because there's too much distraction!! Arrgghh …! Pei-Lin, I got them from Jusco Supermarket. Sometimes you can get them in Pasar Malam too. They're easier to get nowadays compared to years ago..
Lovely Pavlova! I want some!